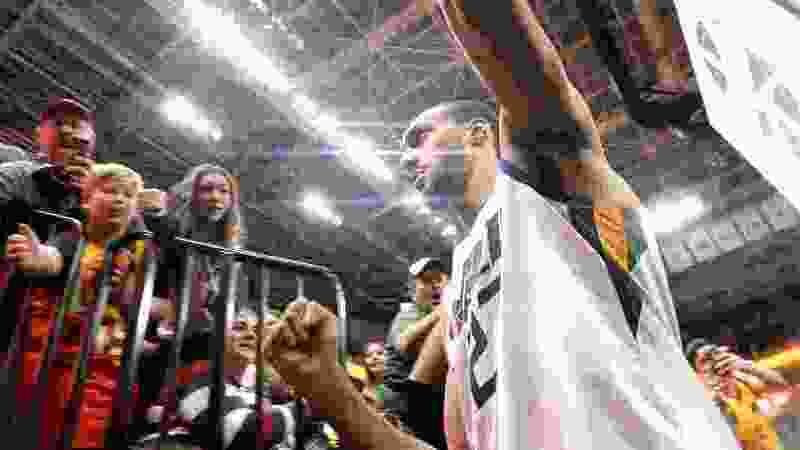 Leah Hogsten | The Salt Lake Tribune Utah Jazz center Rudy Gobert (27) celebrates the win. The Utah Jazz defeated the Atlanta Hawks, 128-112 at Vivint Smart Home Arena, Feb. 1, 2019. Oakland, Calif. • Steve Kerr feels bad about Jazz center Rudy Gobert not going to Charlotte this weekend to participate in the NBA All-Star Game. Just, perhaps, not bad enough to have voted for him as a reserve for the game. Before Tuesday’s game between the Jazz and Warriors at Oracle Arena, the Golden State coach called Gobert “an All-Star-caliber player,” but said the label could be applied to several others as well. Kerr did not elaborate on whether “he didn’t make it” and “first guy off the list” were references to Gobert being left out of the game altogether, or specifically left off of his own ballot of reserve selections. While Jazz general manager Dennis Lindsey has made some noise about presenting to the league a plan that would overhaul the way All-Star teams are picked, including a potential selection committee, Kerr said he was likewise on board with some change, albeit not to that degree. Kerr noted that 12-man All-Star rosters are a throwback to the days when everyday team rosters carried only that many players, and suggested some modernization was in order. The Warriors became tangentially involved in Gobert’s All-Star candidacy when a video of the center reacting emotionally to being left off the team went viral, and Golden State players Draymond Green and Andre Iguodala posted mocking tweets in response. Asked if he had followed or ignored all the back-and-forth in the lead-up to the game, Kerr smiled.